If you are not a dog or a duck, I'm not impressed. We took Scarlett to the Irvine Park and this park means serious business. There is a 15 minute train ride that introduces you to the park grounds, a very tiny lake filled with people riding in over sized paddle boats, hiking trails and the Orange County Zoo. The zoo has a $2 entry fee, but luckily I printed out a coupon online that was buy one ticket get the second free, and to be honest I felt a little bit lame using it. Should I have just coughed up the extra $2 and considered it a donation to the goats, bears and peacocks we were about to see? Hey, these days $2 is a bagel on my way to work...and they charged me $3.75 for two pieces of white bread and a slice of American cheese from the snack shack, I considered us even. The Zoo was surprisingly fun. The first thing that you see when entering is the "kids space". 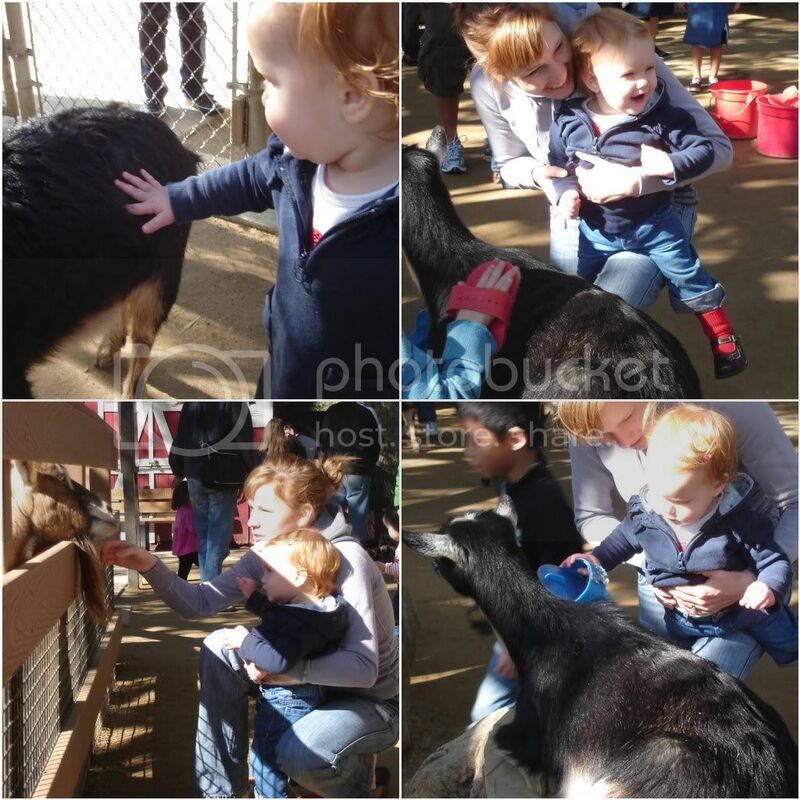 It is an interactive petting zoo where they have buckets full of brushes so that the kids can chase goats and instead of pulling their tails, they can do the zookeepers job and groom them...win, win situation. Happy interactive kids, and even happier shiny coated goats. Although, in true Scarlett Zoo attendant fashion, she was way more interested in putting the brush on her hand and smiling than actually using the brush for it intended purpose, shining goat fur. The rest of our zoo visit was rather uneventful, the cougar was sharpening his teeth on a tree branch, the bears were peacefully hibernating in the corner of their glass box, and Scarlett managed to keep her face in completely uninterested mode the entire time. Overall it was a beautiful day in the park with a stop by the zoo. Maybe one of these days Scarlett will actually smile while looking at animals that aren't over exaggerated, cartoon characters flashing on a screen while I am trying to shove one more bite of yogurt in her mouth.